We are an innovative New Zealand company specialising in the design and manufacture of products for the care, testing and use of battery power. We produce small or large runs of specialist products, which are innovative, robust, reliable, value for money and highly recyclable. 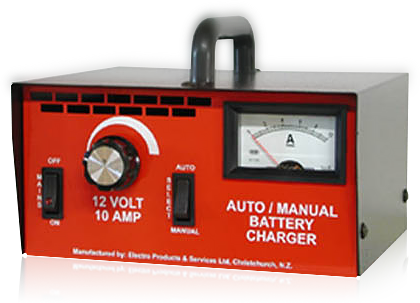 Electro Products & Services specialise in design and manufacturing of an ultra high reliability electronic battery charger, as well as Emergency Lighting products and generator starting. Based in Christchurch EPS supply a range of demanding customers in the energy field. Founded in 1976, the name was changed to Electro Products & Services Ltd in 1983 to reflect the move to changing and related products. At times employing up to 12 members of staff at peak production produced for the following sectors: Air craft, Fishing, Farming, Emergency Services and Fire Protection. 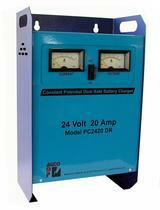 EPS specialise in design and manufacture of a range of Battery Chargers as well as Emergency Lighting Equipement. Our company also offers a repair service for the Forklift Charger Industry.